Andrew counsels clients regarding a full range of financing issues and projects, including single-lender, multi-lender and nationally syndicated credit facilities involving cash-flow lending, asset-based financing, project financing, real-estate financing, letter-of-credit facilities and recapitalization financings, private-placement-note offerings, public-note issuances, mezzanine-debt structures, intercreditor arrangements and loan workouts and restructurings. Biotech. Representation of medical device manufacturer in connection with its $2 billion financing of acquisition. Biotech. Representation of medical technology company in connection with its syndicated $500 million revolving credit facility with $150 million accordion. Energy. Representation of a petroleum company in connection with refinancing of $190 million term loan and revolving credit facility. Direct Marketing. Representation of marketing services company in connection with refinancing of its $80 million revolving credit facility and $120 million term loan facility. Communications. Representation of Canadian subsidiary of global communications company in connection with $30 million real estate financing. Biotech. Representation of medical technology company in connection with its leveraged acquisition by a consortium of investors and the concurrent reorganization of one of its subsidiaries, which financing including a $2.5 billion senior secured credit facility, $1.75 billion aggregate principal amount of second lien senior secured 144A notes, and $750 million aggregate principal amount of senior unsecured 144A notes. Information Technology. Representation of IT solutions provider in connection with its leveraged dividend recapitalization, consisting of a $260 million senior secured term loan facility and a $20 million senior secured revolving loan facility. Grocery. Representation of regional grocery chain, owned by employee stock ownership trust, in connection with $113 million cash-flow based credit facility. Grocery. Representation of regional grocery chain in connection with $135 million asset-based credit facility. Biotech. Representation of medical technology company in connection with issuance of $1.75 billion second lien senior secured 144A notes and $750 million senior unsecured 144A notes. Energy. Representation of oil and gas exploration company in connection with issuance of $125 million 144A senior secured notes. Energy. Representation of oil exploration company in connection with $30 million private placement notes. Grocery. Representation of regional grocery chain in connection with $25 million senior subordinated private placement notes. Auto Receivables. Advised federal savings bank in connection with $100 million auto loan receivables securitization. Resort Financing. Representation of global commercial finance company in connection with restructuring portfolio of resort finance loans in Mexico. Resort Financing. Representation of global commercial finance company in connection with multiple sales of asset-based loans. Healthcare. Representation of distressed skilled nursing facilities operator in connection with workout of senior secured credit facilities. Golf Course Financing. Representation of golf course lender in connection with refinancing of distressed golf course loan portfolio. Utilities. Representation of electric cooperative in connection multiple facility Indenture, including US Department of Agriculture loans and tax exempt bonds guaranteed by the National Rural Utilities Cooperative Finance Corporation. Agribusiness. Representation of agricultural cooperative in connection with its $26.5 million bridge loan and letter of credit backed conduit bond financing. Healthcare. Representation of county hospital district in connection with its $45 million HUD Section 242 Mortgage Loan. Agricultural. Represented livestock reproduction company in $130 million term loan and revolving asset based credit facility. Grocery. Representation of regional grocery chain in connection with $135 million asset based credit facility. 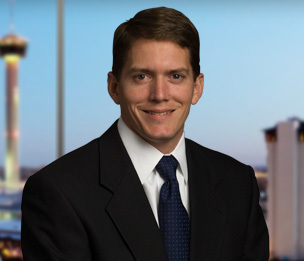 Acted as Texas counsel in assisting multi-national and regional law firms in numerous financing transactions, including advising as to relevant Texas law issues and preparation and negotiation of opinion letters. Andrew also advises clients on a full range of commercial real estates issues and projects, including acquisitions, dispositions, development, financing, leasing, ground-leasing, communication tower site agreements, sale-leasebacks, operations and joint tenancy arrangements. Healthcare. Representation of landlord in connection with 90-year lease of 18-acre hospital site. Nonprofit. Representation of nonprofit tenant in connection with 70-year lease of parking garage site. Retail. Representation of landlord in connection with 30-year lease of retail pad site. Healthcare. Representation of medical center land steward in connection with multiple medical facility ground leases. Healthcare. Representation of medical office building landlord in connection with multiple medical office leases. Corporate. Representation of tenants in single and multi-floor office leases. Corporate. Representation of seller/lessee in $62 million sale leaseback of corporate headquarters. Corporate. Representation of seller/lessee in $19 million sale leaseback of corporate headquarters. Build-To-Suit Representation of purchaser in $27 million build to suit headquarters. Investment Property. Representation of seller in $30 million land sale. Investment Property. Representation of seller in connection with 18-acre land sale for housing development. Estate Planning. Representation of joint heirs in connection with disposition of 2,300 acre ranch. Single Family Development. Representation of buyer in $18 million land acquisition. Mixed-Use. Representation of buyer in acquisition of downtown midrise office and retail building. Representation of a municipality in the negotiation of development and Chapter 380 agreement.